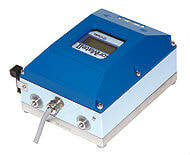 Miniaturised Coriolis Meter for Low Flow Rates. Miniaturised Coriolis mass meter for low flow rates where the flow sensor and transmitter (with display) are assembled in a one-piece construction. The CoriMate is a miniaturised Coriolis meter for low flow rates where the flow sensor and transmitter (with display) are assembled in a one-piece construction.